Volume 5, Special Considerations/Operations, provides paramedic students with information they need about special populations and paramedic operations. The first eight chapters discuss medical emergencies involving special patient populations: gynecology, obstetrics, neonatology, pediatrics, geriatrics, abused/neglected/assaulted patients, patients with special challenges, and patients who require chronic care. 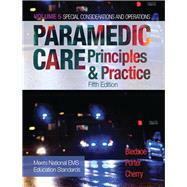 The next eight chapters examine special circumstances that the paramedic may face at any time, including multiple-casualty incidents, rescue operations, hazardous materials, crime scenes, rural practice, and terrorist incidents.